The Incoming page has been updated, so here's your weekly reminder to visit! Details of Eureka's next two Masters of Cinema Series discs have been formally announced. Both titles are due on August the 21st. 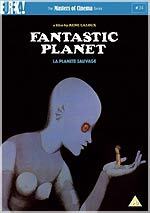 The first is René Laloux’s influential 1973 animated science-fiction classic Fantastic Planet (a.k.a. La Planète sauvage). The film is presented in anamorphic 1.66:1 format, with a choice of original French or English dubbed soundtracks (in Dolby Digital 2.0 format, at 224kbps), and optional ("new and improved") English subtitles. The disc is in Region 0 NTSC format. Bonus features include two Laloux short films, 1965's Les Escargots and 1987's Comment Wang-Fo fut sauvé. The set will also come with a twenty-eight page booklet, with a new essay. The disc also offers a presentation of the film's avant-garde score, by Alain Goraguer (which is much sampled by the hip-hop community, apparently). Note that this isn't mentioned in the press release. 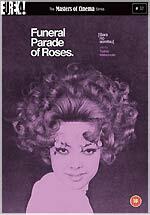 Their second August release is the provocative 1969 Japanese film Funeral Parade of Roses (Bara no soretsu), which was directed by Toshio Matsumoto. This release marks the first home video release outside Japan. The film is presented in 4:3 format, newly-transferred from the director's personal print. The audio is Dolby Digital 2.0 at 384kbps. The film has optional "new and improved" English subtitles. This disc is a Region 2 PAL title. The film is accompanied by a commentary track by Matsumoto; a twenty-three minute video interview with Matsumoto; a trailer (3m) and poster gallery (the latter two items aren't mentioned on the press release). The disc will come with a twenty-eight page booklet, with a new essay by musician Jim O'Rourke. Incoming RRP for both Masters of Cinema titles is £19.99.